Do you know an affordable housing hero? Nominate them for the Roanoke Regional Housing Network’s Affordable Housing Advocacy Award! Decent, affordable and accessible housing is the right of every citizen and is critical to the economic health and development of our region. To further its mission to encourage proactive involvement in housing issues, the Roanoke Regional Housing Network, a standing committee of the Council of Community Services, created the Affordable Housing Advocacy Award to recognize and reward the outstanding advocacy efforts of an individual or agency in our region. The award will be presented at the organization’s Roanoke Regional Housing Symposium. The recipient will receive $500. 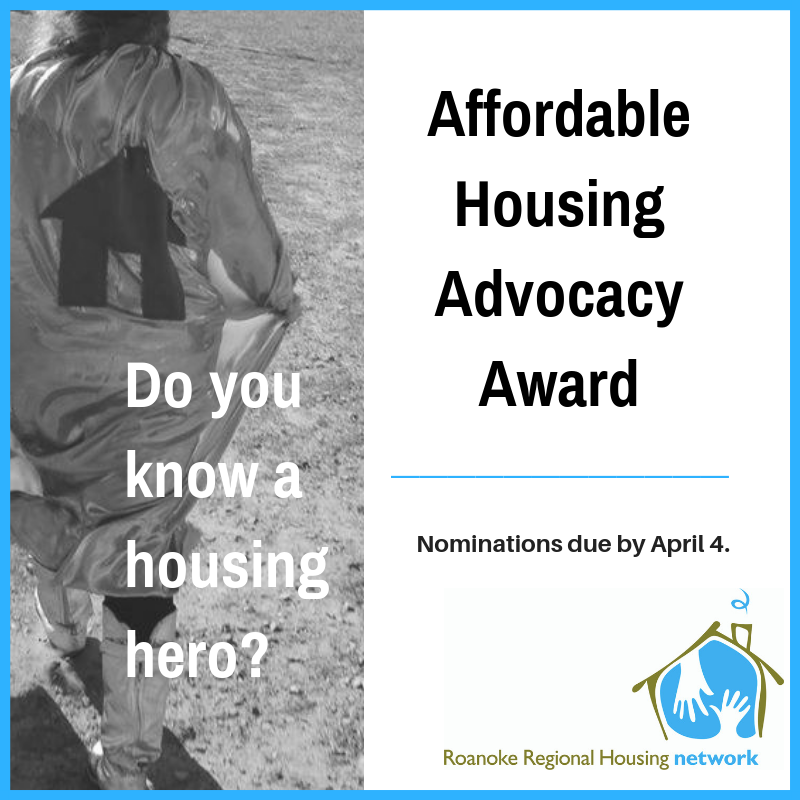 Nominations for the Affordable Housing Advocacy Award may be made by any member of the Roanoke Valley community. Nominees may be member agency employees, volunteers, or any other member of a specific community so long as their advocacy efforts have been notable. Elected officials are also eligible for consideration. Nominations must be received by the chair no later than April 4. Please email the attached nomination to Matt Crookshank at mattc@chrcblueridge.org. If you have questions, please call 540.266.7554. The Affordable Housing Advocacy Award Selection Committee shall be comprised of the RRHN Chair, Vice Chair and symposium planning committee. The committee shall meet at the close of the nomination period to discuss and select a recipient. The committee shall submit their selection to the Chair in preparation of the award plaque and $500 check. Nominations shall be scored in accordance with the above criterion and point system. The nominee with the highest score shall be selected for the award. The Selection Committee shall have the ability to make more than one award if there is a tie or it is felt that more than one Affordable Housing Advocacy Award is warranted. No more than two awards will be given during any award period. Please email this completed application on or before April 4, 2019 to Matt Crookshank at mattc@chrcblueridge.org. 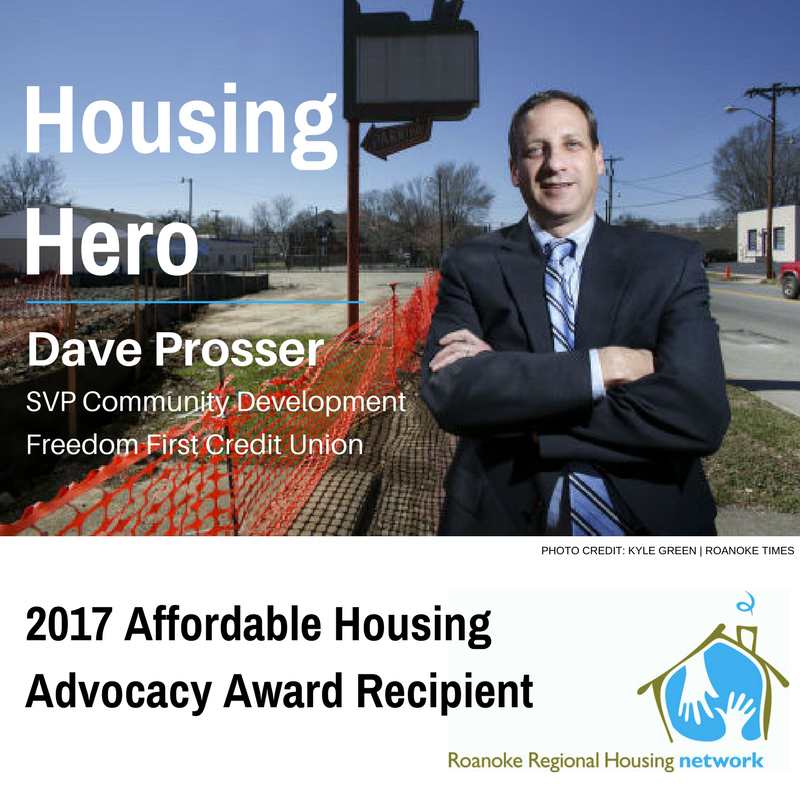 Dave was awarded the Roanoke Regional Housing Network’s 2017 Affordable Housing Advocacy Award on May 4, 2017 at the 2017 Housing Symposium.